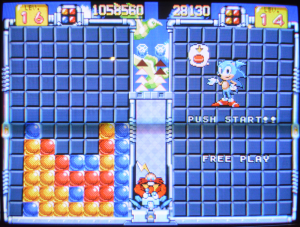 SegaSonic Bros. is a falling blocks-style puzzle game for one to two players; at first glance it seems similar to Puyo Puyo, Tetris, or Columns. Your blocks are made up of four Sonics in combinations of blue, red, or yellow, and the goal is to make those blocks disappear. The further you progress, the faster the blocks fall. It plays unlike any of the aforementioned games, however, as the key to making blocks disappear is to encapsulate them with an outline of one color of Sonics. Every outline you make will do damage to Eggman via electric shock, with larger outlines and combos resulting a bigger shock for the poor Doc (heh). 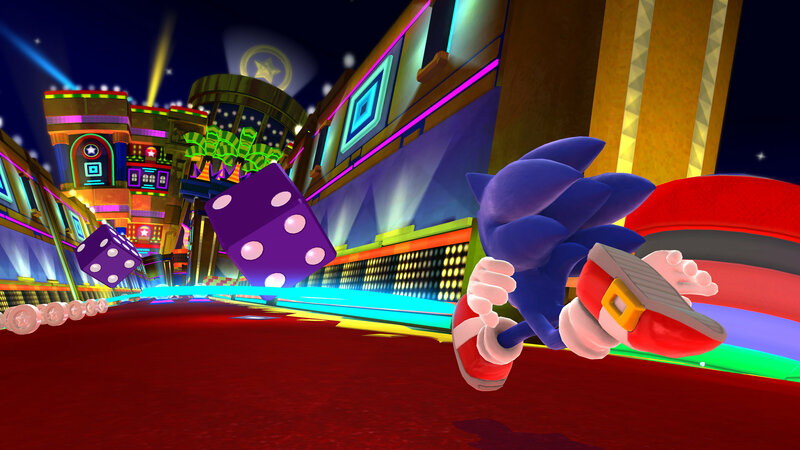 Beat on him enough and you can earn a Chaos Emerald that will wipe out all the blocks from the row it lands on upwards. Things only gets tougher once you reach level 30, as white Sonics get thrown into the mix on top the ever increasing drop speed. This all may sound confusing, and indeed it definitely takes some getting used to. 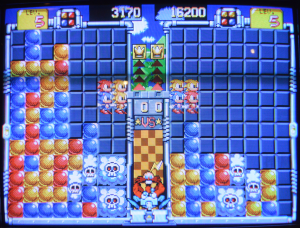 During the game, blocks can only be rotated clockwise. I don’t know if this was how it was intended or if it was just how it was set up for the show, but it was probably the single most perplexing part of the controls. There was no feeling more frustrating than being in the middle of an action-packed round with blocks dropping fast, the game showing you that you’re about to make a big move, only to instinctively press the rotation button again. By that point, it’s too late. You hope in vain that you can rotate three more times in the split second you have before your move is made final, but it’s no use. In addition to that, left and right movement felt very loose, a little too much so. I found myself fearing that I was going to move my blocks too far one way. If these issues were sorted in development, I think it would have made a big difference. The art style screams Sonic 1. 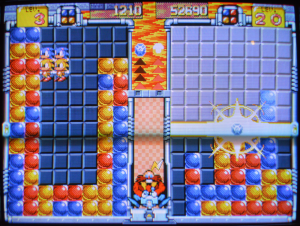 From the moment the cabinet is first powered on, you’re greeted with the “SE-GA!” screen lifted directly from that game. This is speculation on my part, but I believe this was almost definitely put into development shortly after Sonic 1, but before the dev team in Japan were aware of Sonic 2. There are four alternating backgrounds, all from the original Sonic – Green Hill Zone (“Again? !”), Marble Zone, Spring Yard Zone, and the Special Stage. The little Sonics look strikingly similar in appearance to his first outing on Game Gear, down to the seemingly missing nose. The larger sprites are also reminiscent of the original game’s art style. 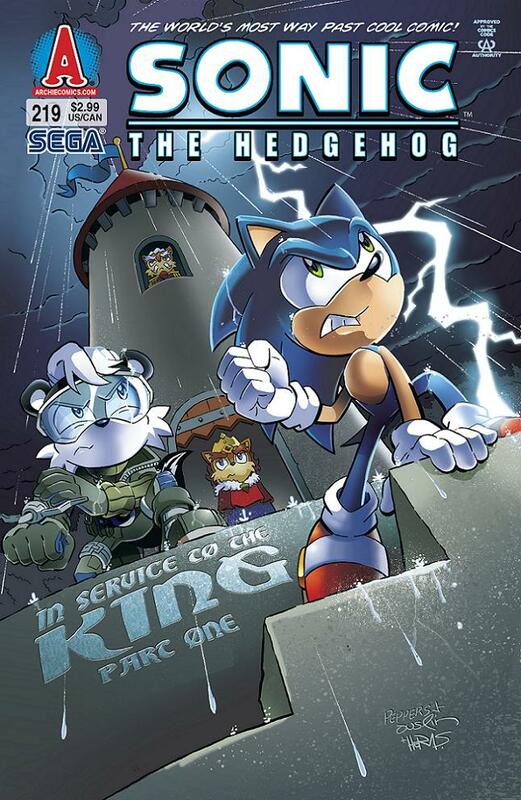 Speaking of the little critters, remember those white Sonics I mentioned earlier? In person, they look light blue more than anything, so they do not contrast well with blue Sonic at all. 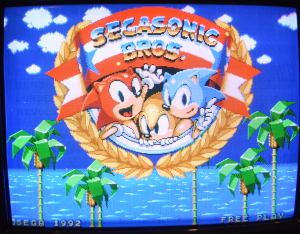 What’s perhaps the most confusing part is that SegaSonic Bros. is running on System 32 hardware, so there was plenty of space for more palettes. Why not throw in a green Sonic instead? While the visuals are familiar, the same cannot be said for the music. Granted, I was in a big showroom with hundreds of games and hundreds of people, so the tunes were tough to make out. What I could hear however was definitely nothing like any Sonic game, before or since. The higher ends I was able to pick up had an easy, jazzy, almost mischievous tone about them. See if you can decipher it for yourself in the video. … that is, until you get cut off by the incredibly annoying alarm sound that rings way too loud way too often. This will go off to warn you when your space to work with starts to narrow down to columns of three. I understand the idea is to give notice to the player, but it happens so frequently that it goes from a helpful warning to a bothersome pest rather quickly. Nitpicks aside, I very much enjoyed my time with this game. To sum it up, I found it a little flawed, but fun! It was kind of surreal to take a little glimpse into what could have been and get my hands on a little piece of forgotten Sonic history. I think with a few tweaks, this game may have passed its initial location test in Japan, and who knows what effect it would have made on the franchise from there. 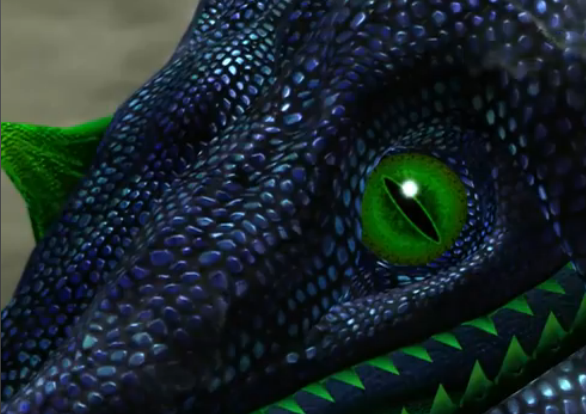 If the game is ever put out for the public again and you get the chance to play it, don’t hesitate to give it a shot. Even if puzzle games aren’t your cup of tea, I definitely think it’s worth just it to take peek into this sort of “alternate timeline” of the series. Special shout-out to Sergio for giving me the heads up about CAX and SegaSonic Bros.